Turmeric, native to southeast India and used often in Indian cuisine, is considered to be a ‘super spice’ due to it’s apparent health benefits. While not everyone enjoys the unique flavor of turmeric, the various apparent health attributes and home remedies may be a good reason to incorporate it into your diet. Note: Turmeric is very high in ORAC antioxidant value! Turmeric is part of the ginger family and contain chemical compounds called curcuminoids – natural phenols with a pronounced yellow color. Some research shows compounds in turmeric to have anti-fungal and antibacterial properties among others, and ground turmeric is one of the highest rated spices for it’s ORAC value (Oxygen Radical Absorbance Capacity). Turmeric is a spice that gives curry powder its yellow hue and peppery flavor and has been used for thousands of years as both a cooking spice and a medicine. It enjoys widespread popularity as an ingredient in various home remedies. 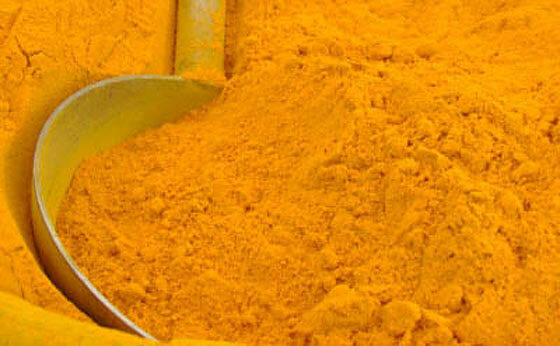 Medical research into turmeric’s curative effects even includes fighting cancer and lowering cholesterol. A teaspoon of turmeric mixed into a cup of yogurt (or other) makes a good home remedy for indigestion. According to the University of Maryland Medical Center website, the curcumin in the turmeric stimulates the gallbladder to produce bile, which may aid digestion. Mix turmeric powder with honey to make a paste, and apply over freshly-washed cuts and scrapes to prevent infection. Turmeric has antibacterial and antiseptic effects; it can also be used to control bleeding from fresh cuts. People suffering with arthritis can turn to turmeric to treat their symptoms of painful, stiff joints. A paste made by mixing a teaspoonful of turmeric with extract of ginger is applied to affected areas. According to the National Library of Medicine website, curcumin in turmeric lowers levels of inflammatory enzymes. To combat colds and respiratory infections, mix 1 tsp. of turmeric powder and 1/4 tsp. of crushed black pepper into a cup of milk. According to the National Library of Medicine, turmeric may have antiviral properties. Take one half teaspoon turmeric with 1/4 teaspoon of black pepper and swig it down with some liquid. Within 15 minutes it’s working to alleviate your pain. Also works wonders on joints and muscle pain in this way. Research at Baylor University Medical Center held clinical trials to show that curcumin (curcumin is extracted from turmeric) is nearly as powerful as Prozac, when it comes to easing depression symptoms. NOTE: Buy your turmeric from reputable brands and sellers. I have read that there have been issues with some turmeric being counterfit. This is also true of many other spices as well. When I first read about this awhile ago, I stopped buying my spices based on price alone (discount stores, little known brands and labels, etc.) and now I mostly buy from known brands and companies (I always look at online reviews such as from Amazon). Do you have your own home remedies or experiences while using turmeric? Thanks Ken. I’m printing this one for my medical binder. I sprinkle turmeric into a lot of foods during the latter part of cooking. Many times, you can’t even taste it and it sometimes helps with the appearance. For instance, I mix a couple of tablespoons into savory beef stew. It just tastes of beef; no one can tell it has turmeric in it. Turmeric also goes into most of my chicken dishes, as well as any noodle dishes, such as lasagna. The tomato and garlic and onion mask the flavor. You can add it to chilis, beans, ground beef for tacos, and soups. Give turmeric a bit of a sprinkle the next time you cook. You’ll be surprised how easily it incorporates into things. Even a cake! I too buy my spices from Penzey’s. What a huge difference in taste and quality. I had a couple of store bought spices that I compared with what I bought through Penzey’s, side by side they tasted like two different spices. I don’t think I can ever go back to store bought. Store bought was bland and weak in flavor. It makes me think it had been cut with something else to give it volume. I use it in chicken noodle soup, and most any chicken /gravy type dishes.